Win A Pink Cupcake Apron From Carolyn's Kitchen! Two of my favorite words that start with the letters a-p-r are "April" and "apron". 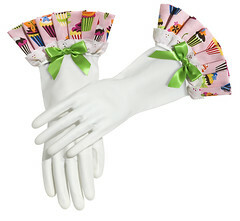 Since it is almost April, it is time to give away a cute little pink cupcake apron and glove from one of our advertisers, Carolyn's Kitchen. "If you could be any item in your kitchen, what would you be?" Sample answer: a cupcake baking pan. A winner will be randomly selected Wednesday, April 1st (no fooling)! Anonymous comments will not be considered. In the meantime, click here to view CAROLYN'S KITCHEN entire apron collection" Good Luck!!! my stand mixer...i'm the type of person that likes to feel "needed" and i need and use my stand mixer every week...can't imagine my life without it! I would be my Kitchenaid mixer! I love that thing and it is pink. Awesome! I'd probably be a non stick cake pan with a removable bottom. Who wouldn't love me? Non stick for easy clean up and a removable bottom for perfectly shaped cakes!! I would be my kitchenaid mixer! It gets used all the time and is always holding something sweet! I would definately be a gian cupcake cake pan! My favorite. My frosting knife. It gets aaaalllll the love & attention. A bright red kitchen aid blender! my Wishbone Bountifuls salad dressing - cuz it's my favorite and I wanna be someone's favorite! If I could be any kitchen appliance, I'd be a Kitchen-Aid Mixer. No job is too big for the Kitchen-Aid, and the end result delights all. I would be a foil cupcake liner, only because they aren't as likely to pull cupcake away with it like the paper ones do. That way more of the cupcake can be savored and enjoyed by my consumer. :) eat up! I would be the cupcake carrier, so I could bring cupcakes everywhere I went! If I could be one item in my kitchen, I would be my Lime Green Kitchen Aid - because it does wonders for everyone and continually makes me (and my hubby) happy! If I could have anything in my kitchen, it would most def be a cool container to store (and keep the shape) for the hundreds of cupcake liners I have. I would be a kitchen timer. Because they are always needed and very helpful. The very old, but powerful and well designed hand-crank beater I inherited from my Grandma. I would so be a chef's knife. Versatile, essential and sharp! I'd be the coffee pot... it's the most loved! If I were any item in my kitchen it would be the spatula. It's always covered in cupcake batter or frosting! I would be the cookie jar!!!! I would have to be a mixer. Not only do I love my mixer but I feel like it has so many purposes, it mixes, whips, etc. It's amazing and I wouuld like to be an amazing thing in the kitchen! My red Le Creuset Round French Oven. LOVE it!! I'd be a measuring spoon because they are often put to good use and they are always surrounded by friends (all the other fun tools in the same drawer) and family (the other measuring spoons on the ring). Thanks for the giveaway and the Intro. to Carolyn's Kitchen! Oooh, that's a hard one! I think I'd be...my fabulous teal cupcake courier! If I could be any item in my kitchen I would be an oven. Seriously. So much good food comes in and out of there. I'd want a taste too! I would be a beater blade on my mixer, so I could taste all the yummy cakes! I would be a mixer! I love to bake and the mixer is one of my most used items! I would be the offset spatula, just because its so handy:) Also LOVE the aprons! Great contest. That apron is adorable. My answer: not so much an item, but i would be a passionfruit. cause that is what my name means. I would be a vintage apron, since I am vintage !!! I would be a spring form pan! It has to be the best kitchen items out there! I would be a wooden spoon. Always dipping into the yummy icing / cake mix for a taste! My Pink Kitchen Aid mixer!! I love it! I would be my blender: its mint green, great at its job, cute, and kind of retro. I would be my tea kettle - it's something I use every day because a cup of tea goes with everything! I'd be my French Press. Simple and elegant. I would be my giant cupcake pan! So much cupcake goodness! my cupcake courier..or an apron to get all the extra goodies :) thanks for the giveaway! My mixer. It has the funnest, and best tasting life. a wooden spoon, because it gets used in just about everything I make and therefore I'd get to taste everything! My Cuisinart blender! I'm completely in love with it. In my kitchen(and in my world as the mother to an active toddler)I would be the timer...it gets all the attention and always has it's buttons pushed. I would be the teapot. I'd be Mixxy(my KitchenAid mixer). Oh, the yummy things she's seen!! I would be a silicon baking mat. I love my kitchen aid mixer too - like everyone else here. Have had it for 10 years & given her quite a workout on a regular basis! I'd be my hotdog roller. Hands down. The mixing bowl that belonged to my grandmother--think of all it has tasted in it's lifetime! my orange kitchen aid! LOVE IT. I'd be an oven -- stick something in me and watch me heat up. A whisk - I want to be right in the thick of it! My coral-colored rubber spatula touches everything I make, from batter, to icing, to melted chocolate. And it's beautiful, so I'd have to go with that. my orange and pink oven mitts. If I could be anything... hmmm... id be piping tips. I could not live without those! I would be either my Tiffany blue kitchen aid mixer Turq ('cuz she's a sassy girl) or I'd be my favorite little hand whisk! I'd be my spiffy new double oven cuz that's where all the magic happens and the yummy fresh baked cupcake smell comes from! I would be my silicon baking mat. I like that it is slick and easy to use. Butter! I'd be butter. Butter makes everything taste better. My frosting is rich and creamy thanks to a pound of butter. My cupcakes moist and dreamy. Oh butter how I love thee! My red kitchenaid mixer! So shiny and the spotlight!! I would have to be my kitchen aid stand mixer. I would be the frosting tips that add the finishing touch to my confections! My KitchenAid mixer because everyone always loves what is made in it....yummy. rubber spatula because it helps me get every last drop of YUM! I'd be a microwave oven because I'd get all my jobs finished very quickly. I'm thinking after purchasing a Le Creuset dutch oven recently that I would be just that...my BIG oval Lime green dutch oven. Since purchase, I have used it at least every other day, some days more than once. It is simple the MOST versatile, sturdy, easy to clean piece of cookware I have EVER owned...and I LOVE it! I would be a mixer, because I could combine good ingredients to make something great! I would be the cooling rack since so many delightful things would be cooling on me all of the time. a mini kitchenaid food processor! A pizza stone. hot, solid, and covered in steamy dough. I would so be a kitchenaid. The gigantic kind with the up-down style motion. my size 16 stainless steel ice cream scoop, because it took me ages to find the right size to bake the perfect cupcakes and it has made my life so much easier. total genius. I would love to be a cupcake liner! I want to have the proud job of holding a delicious cupcake while it bakes!!! Yay!! Utilitarian, elegant, timeless...I'd be a SPOON. A spoon is good for sampling, "mixin' it up," gently ladling, (and also makes a great wacking tool, if the situation calls for it). It has Zenlike concavity, at once both hollow and full; one of the oldest tools, it has a gentle, rounded shape (so I identify with it). Also, I like spooning. I would be my cupcake cookie jar. It is super cute and holds delicious treats! Plus it always smells good. a piping bag...so i could get squeezed on a regular basis! i'd be my trusty chef's knife. sharp and indispensable. dulls with over-use and needs a little bit of tlc. My "gold"-leafed + glass candle-holder-dish-converted-into-a-serving-platter -- made the jump from pretty decoration to pretty AND useful! I would be a blender. I like to try to work on the rough edges of things and make them smooth and harmonious. I would have to say a very sharp knife. I would be... a heart-shaped rice mold for obento~! And I'd be pink. I would be an..... egg holder or an apron. I would be a piping bag and pretty piping tip. It can make anything look fancy! I would like to be a rolling pin. I would help make beautiful pie crusts and cookies and sometimes wouldnt it be fun to flatten something? My ice-cream maker. Who doesnt love ice cream? I would love to be my apple dish. Always on the counter, always looking around the room. Yeah. the blue and glittery rubber spatula that I have!! My rubber spatula; he gets to taste all of the delicious things I make & bake first!! A rolling pin. So simple and so strong. I would love to be my "Maryse"! I'd be a mixer - I'd like to think I help blend people together. Haha :) I so love that apron! I would be a whisk! I'd have to go with my trusty blue plastic ice cream scoop. It is the perfect size to portion cupcakes! I would be my kitchen aid mixer! I would be one of my oven mits, but it would be hard to say which one, probably the right hand one, because I've been around for many years, having blemishes and scars to prove it, and feel so at home here, and it looks like I may be here forever. If I could have anything... probably every single attachment for my kitchen aid mixer :) especially the ice cream one!!! If I could be any item in my kitchen it would have to be the SALT. Such a small thing that makes all the difference in in the world. Thanks for the contest! I am torn – I would either be my pink rubber spatula (with cupcake designs) or my pink kitchenaid mixer. Both get to spend LOTS of time with cupcake batter and frosting!!! I would be a mixing spoon, because someone would always want to lick me. The ice-cream scoop! I love ice-cream! I would be the jar of sugar- you always know exactly what you're gonna get and it's always sweet! LOVE THE APRON AND GLOVES!!!! I would have to say I'd be a fancy hook so I'd be able to wear that cupcake apron more than anyone else! Ah! I think I'd be my whisk. I just love whisks so much. And the word is so fun to say! Right? WHISK!!! I would have to say Kitchenaid Mixer...the most beloved item in my kitchen. I would be my vintage crystal cake plate because it's cute and gorgeous and best of all shows off all the delicious cakes and cupcakes that come through my kitchen. Plus, it's totally evil in that it just dares you to have a piece of the delicious cake that's sitting on it! TONGS! to pick stuff up. I would be my mixer bowl because then I'd have a chance at getting all that yummy cookie dough and cake batter! If you could be any item in your kitchen, what would you be?" My pink kitchen aid measuring cups! i would be my cake decorating kit, because i love to make things pretty. I'd be a whisk. It gets into everything in my kitchen! Now, I need to go make the awesome April Fool's cupcakes I'm planning for tomorrow! Yeehaw! I would definately be cupcake sprinkles!!! love those things!! my cupcake courier. especially when it's full of cupcakes! A cake plate, definitely! I'd hold up nummy treats for all the world to see! I would be my cute lil single cup cake carrier. I want to be the beaters of the mixer. I would be my tupperware cake taker because everyone is happily surprised to see something sweet inside! Hands down I would be my Cupcake patterned oven mitts! I'd be a pairing knife. I use it every day! my silicone spatula. its used on so much! I would be a Microwave. I'd be a piping bag! The best thing about cupcakes is the frosting! If I could be any item in my kitchen I would be my Kitchen Aid mixer! Then I could wear red all day and make wonderful yummy goodies! My whisk, long and lean with the ability to whip anyone into shape! I'd definitely be my KitchenAid mixer. Not sure you need it, but can't live without it once you have it! I'd be my grandmother's blender. It's been around forever and it's still kicking! a toaster - b/c it is toasty warm. I'd be my measuring cup!!!!! That way everything comes our perfectly proportioned!!! A pink cupcake carrier like the one I just bought! The oven. Not a sleek brand new model, always covered in somethin', a bit wobbly, runs too hot, and a tad tempermental...but indespensible all the same! I would have to be my wine decanter. I used to have this adorable set of red, yellow, green and blue measuring spoons when I was young. They came with a cookbook that I got for Christmas one year. They weren't the fanciest set of measuring spoons, but they sure made me happy and sparked my interest in baking! I'd definitely be those. My 32 oz. Madagascar Bourbon Vanilla...so yummy, so rare, soooo perfect. My Kitchen Aid stand mixer!!! My mini cupcake liners. They are so cute. As a poor college student, my kitchen is pretty minimal so I don't have a ton to choose from. I'm going to have to go with knife. Always useful because it's sharp. My silicone mats ... I wish I'd tried them sooner.